It comes less than week after the Awful Announcing article chronicling Horowitz’s takeover of Fox Sports Digital and turning it from articles to all-video. The site with various clips of its debate shows on the front page of FoxSports.com became no more than a YouTube channel thus causing its traffic to fall precipitously. 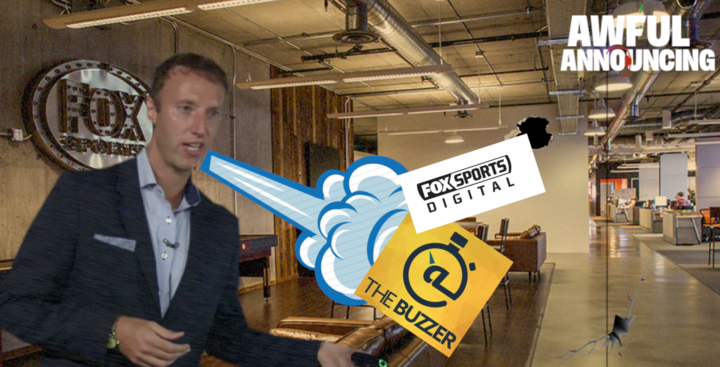 Horowitz certainly didn’t endear himself to Fox Sports digital employees when he announced the new strategy. And apparently this hasn’t sat well with Fox Sports management which surprisingly pulled the plug on Horowitz’s explosive tenure. It is not known what caused Horowitz’s abrupt departure, though sources said it was not related to changes made at Fox Sports Digital, which was covered extensively by Awful Announcing last week. Shanks will seek a replacement for Horowitz. He will handle Horowitz’s responsibilities until then, and FS1 programming, marketing and scheduling and digital will report directly to him. Several women, including prominent on-air personalities, have already been interviewed about their treatment at Fox Sports, according to two people familiar with the investigation. Horowitz came to Fox Sports in 2015 in hopes of turning around the fortunes of FS1, luring Colin Cowherd and Skip Bayless from ESPN and hiring Jason Whitlock. Gone were studio shows like Fox Sports Live and in were debate shows like Speak For Yourself and Undisputed. And while these shows were doing better in the ratings than the programs they replaced, they still lagged far behind ESPN’s numbers. Horowitz’s time at Fox follows his rather explosive tenure at NBC’s Today show where Horowitz was fired just a month before he was to officially begin as the man in charge. Reports about his NBC experience later surfaced and perhaps it was a harbinger of things to come at Fox. The reasons are unclear for the abrupt departure but he has hired powerhouse litigator Patty Glaser to represent him, suggesting he takes issue with the reason behind his exit. Whatever the reason behind his firing, Fox felt it could no longer go forward with Jamie Horowitz and it leaves him with few options for his next gig.